Mt. 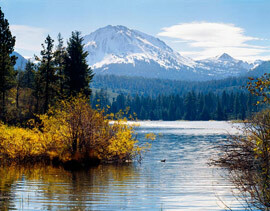 Lassen from Manzanita Lake, Lassen Volcanic National Park, California by Philip Hyde. June 14: Left home at 8:15 am. Sunny with scattered puffy clouds. North to Susanville, through Adin to Alturas. Brief lunch stop along roadside. David piled out with his “new” twin lens reflex camera (out of commission) and tripod Philip gave him. David’s purpose was to “take pictures of flowers.” Marvelous to behold David’s detailed imitations of his father. He woke up knowing this was the day we were leaving for Alaska. “My head is shaking because I’m so excited.” The land showed beautiful lush green evidence of the wet season we’ve had. The pluvial lakes were all extra high as well as many no-name lakes in low places. Farm country, range cattle and open space. First open range, bluffs of lava flows, then into lodgepole pine forest. 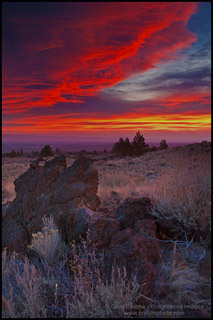 Spent the night at Lava Butte, Oregon in the planted pine forest for possible pics in the morning. The Three Sisters, Bachelor Butte, Mt. Brokeoff all snow-covered. June 15: Woke up about 6 am and drove up toward the top of Lava Butte, but the gate was closed until 9:30 am. Started out on foot, David and Philip with their cameras and tripods over their shoulders. A park ranger stopped and gave us a ride to the top. On foot again we circled the crater, David and Philip taking pictures of good views of the peaks including Mt. 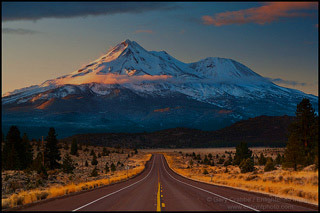 Shasta and Mt. Theilsen. Into Bend, Oregon to Jerry’s Trailer Supply to see about repairing the Camper’s Monomatic Toilet that had been leaking. Philip bought the faulty valve and repaired the toilet himself. I grocery shopped in the meantime. North to Madras where we turned into the Warm Springs Reservation to go swimming at Ka-Nee-Ta again. David enthusiastic and worked hard practicing swimming. Leaving the reservation we were treated to masses of wild flowers in all directions: Mules Ears or Wyethia especially abundant, lupine and buckwheat grass lush everywhere. Snow-topped Mt. Jefferson was glorious. North to Dalles Bridge. Wheat fields turning gold. David woke up from a nap in his bunk over the cab, just as we crossed the Columbia River, looking upstream at Celilo Dam (Dalles Dam) that submerged the once mighty Celilo Falls. After dinner we drove on to Yakima State Park, Washington, on the banks of the Yakima River. June 16: Before leaving Yakima State Park, David had a swing and play on the equipment nearby. Beautiful clear morning going over Snoqualmie Pass. Cold, lots of old snow, some fog on top. Into Seattle traffic lineup across Lake Washington floating bridge. Into worse congestion trying to reach parking lot at Seattle Center. Finally found our way around traffic by going way around Queen Anne Hill to get to the other side of the city. We rode downtown on the Monorail. Shopped at the REI Coop, then returned to Seattle Center. We walked through the Fire Engine Museum. David chose a fire engine to ride on in the nearby concession. Just made it to Mukeliteo in time to get on the ferry to Columbia Beach on Whidbey Island. We drove the length of Whidbey Island in late sunlight to Deception Bay State Park (Deception Pass State Park). At Deception Bay State Park we ate a quick dinner at Rosario Beach while watching a couple put on all their diving equipment. We walked down the beach and around the headland as we had on a previous visit. David enjoyed the tide pools and rock scrambling. June 17: Caught the 8 am ferry from Anacortes. Another perfect sunny day with the water glassy and smooth. Ferry stopped at Lopez Island and Orcas Island, then on to Vancouver Island, British Columbia, Canada. At Sidney, Vancouver Island, no trouble with customs. They only wanted to know about stone fruits and didn’t want to look into anything else. In Victoria we parked downtown and walked to the harbor, tourist information and the Provincial Museum. Also parked on Government Street and looked around in the shops. Parking lots and streets were nearly empty. Canadians very pleasant and the lack of automobile traffic is refreshing. The Provincial Museum exhibited Indian Canoes, Totem Poles, Lodges and many other artifacts. We bought David a small hand-carved dugout canoe. June 18: North up Vancouver Island on Canada Route 1 in intermittent rain. Drove into Goldstream Park to admire the lush, undisturbed rain forest. Around Comax, development has reduced the charm and the natural setting. Pulled into Miracle Beach Campground. Picked out a campsite on Maple Lane. They were all like private rooms with leafy walls and ceiling. Rain stopped, so we cooked hotdogs over alder wood fire. We walked out to the beach of large pebbles and many driftwood logs. Coming back we wound around a network of trails through the woods. The wild roses were the largest we have ever seen, as big as Philip’s hand. Found a flame-colored honeysuckle, foam flower and other delicate white blossoms in the deep shade. Mosquitoes are bad here. June 19: At Black Creek we stopped to walk along driftwood on the beach and rocks of the breakwater out to an old ship hull beached in the sand. David was singing and beachcombing along the way. Soon his pockets were bulging with crab skeletons, shells and driftwood. When we returned to the Camper, he arranged them in a display in his “studio.” David sleeps in the bed above the cab and rides up there sometimes while we are driving. He calls it his “studio.” He is also very busy building a float plane with Nuts and Bolts and a ferry and a fire boat out of Lego. Lunch at Elk Falls in Strathcona Provincial Park. Philip walked to the overlook. He said there was only a trickle of water because it had been diverted for the hydro-electric works. Up to Middle Lake and across the crest of the mountains. Everywhere logging and fire scars but many small lakes covered with blooming water lilies. Some light rain, but a stiff south wind raised the clouds until we could see the snow patched mountain peaks. The Strait of Georgia narrows and the opposite shore was close, with the dark red vertical faces of the mountains, and forests on their layered shelves, all easily visible. Made another stop for the view down into Crown and Zellerback’s Duncan Bay Mill and Pulp Plant, a vast layout of mill, plant, sawdust barges, log booms and machinery with lots of activity and smoke emissions. No road sign for Morton Lake Park, missed it completely and the town too. Signs and even towns not visible where they were shown on the map, we’ve found is typical of British Columbia. Ended up camping in a gravel pit on the left side of the road. At least David had a big pile of white sand to play in.